Our gold standard. Shake & clean. 5x benefits vs vacuuming. For newer looking carpets. Shake well before opening Shake - Open - Sprinkle - Brush - Vacuum - Reseal Easy to Use 1. Preparation: Vacuum clean the carpet before use. 2. Before use, shake the bag thoroughly to maximise product coverage. Turn the bag around and pull to completely remove both sealing strips from the bottom. 3. Hold the bag by the handle and shake to distribute the powder. No dampening with water is required. 4. Work in the Vanish Clean & Fresh Powerpowder with a brush. 5. 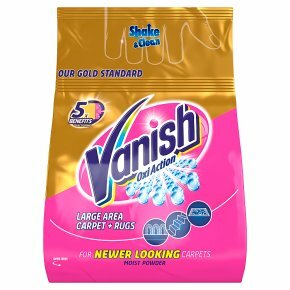 Allow the Vanish Clean & Fresh Powerpowder to work until the carpet is completely dry (approx. 20 minutes). Keep the room ventilated during drying and vacuuming. It is still possible to walk on the carpet. 6. Completely vacuum up the dried powder. Change your vacuum cleaner bag regularly. 7. After use, carefully roll up the pouch towards the adhesive tag, gently lift the tag and pull it over to reseal. 8. In rare cases there may be light spots after vacuuming. In these cases, stain residues bind powder to them. We recommend removing the remains with a soft brush and then vacuuming. Avoid using water in any case. Usage Advice Test a hidden section of the carpet for colour fastness. In case of spillages or half solid substances (e.g. butter, ketchup) remove excess stains and pre-treat with Vanish Oxi-Action Carpet Stain Remover. Check vacuum cleaner is in working condition, according to manufacturer's instructions. Ensure the bag is well fixed and not full; change bag regularly. Check presence and status of filters. If using a bagless vacuum cleaner, empty the tank and clean the filter before vacuuming the powder. Empty the vacuum cleaner tank regularly. For central Vacuum Cleaners refer to manufacturer's indications. Re-close pack of best preservation of left product. Do not use with: Water Filter type vacuum cleaners, Water Extraction or Shampooer Machines, any other machine treatment involving water.